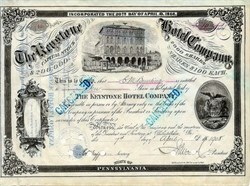 Beautiful certificate from the Keystone Hotel Company issued in 1908. This historic document was printed by the M. H. Traubel Lithograph Company and has an ornate border around it with a vignette of the Keystone Hotel. This item has the signatures of the Company’s President, A. Wood and Assistant Secretary, Robert Koff and is over 101 years old. This is certificate #40 issued to C. M. Bunting. 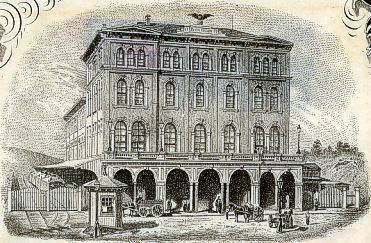 The Keystone Hotel Company was owned by the Pennsylvania Railroad Company.